Last Saturday, D and I went to the Fort as early as 7:00 in the morning for a heart pumpin' Valentines Challenge organized by Barefoot Running Philippines and Vibram FiveFingers. It was a fun but really tiring activity as we were made to do some squats, lunges and tuck jumps with a quick run around the area for each interval. We were able to finish the whole workout in 15 minutes with 156 squats, 110 lunges, and 52 tuck jumps, for a total of 317 reps. I am proud to say that I did 167 reps while D made the remaining 150. Ha! As of this writing, my legs still hurt like hell. It's so hard to walk, sit and go up and down the stairs. After the event, we decided to have breakfast at the newly opened IHOP. Good thing it was just walking distance near Track 30th. 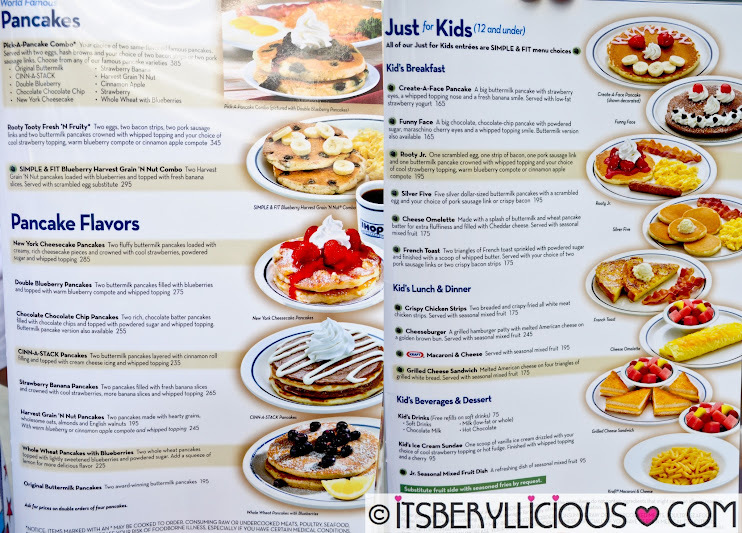 When we reached IHOP, we weren't surprised with the number of people waiting outside the restaurant. As we head inside, we overheard some customers complaining about waiting for more than an hour already. We didn't mind though as D and I were both very willing to wait. Surprisingly, our names were called 40 minutes later. See, it wasn't that bad. D got himself an order of the Big Steak Omelette (P325) which is made with a splash of IHOP's famous buttermilk and wheat pancake batter and served with two fluffy pancakes. The Big Steak Omelette is a big omelette with tender strips of steak, hash browns fresh green peppers, onions, mushrooms, tomatoes and Cheddar cheese, served with salsa dip on the side. I, on the other hand ordered for the Spinach & Mushroom Hash Brown Stack (P295) 'cause it really looked good on the picture. I opted for a seasonal fruit siding since D and I could both share the sidings we've chosen. 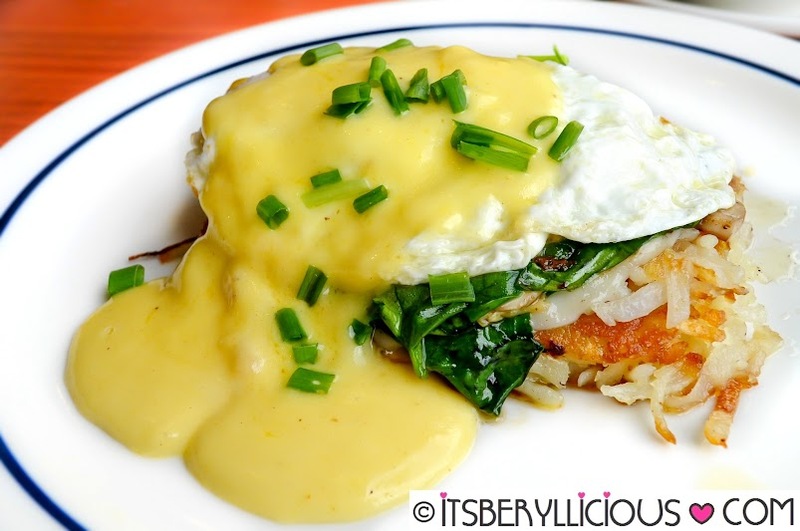 Personally, I prefer the Spinach & Mushroom Hash Brown Stack over D's Big Steak Omelette. I think he also agrees on this one, as he said that he would probably order this again on our succeeding visits. 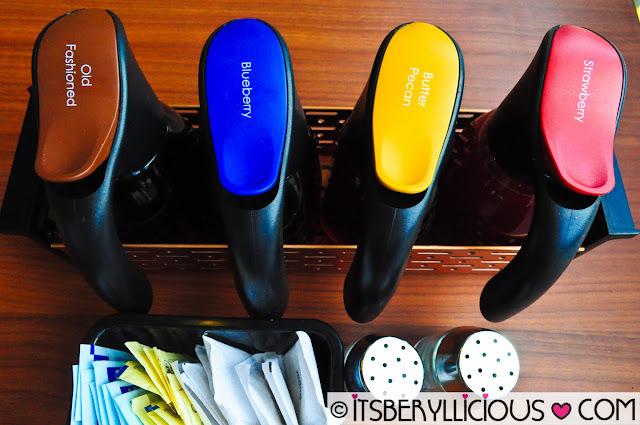 After finishing our orders, we started drizzling these assorted syrup flavors over our pancakes. It was hard to decide which one is my favorite since each has its own distinct flavor. D loved the Strawberry 'cause according to him it tasted like his favorite strawberry sundae syrup. For me, I think I'd go for the nutty and creamy taste of the Butter Pecan. IHOP's pancakes were big, soft and fluffy. 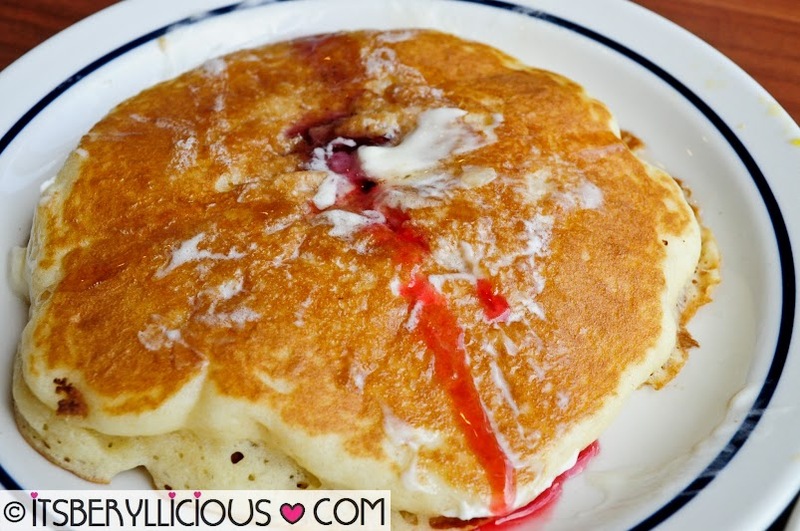 It may look simple but I think that's the secret of IHOP's pancakes.. Simplicity at its best. It's all about having the finest quality ingredients and putting them together to make a classic and hearty breakfast meal. 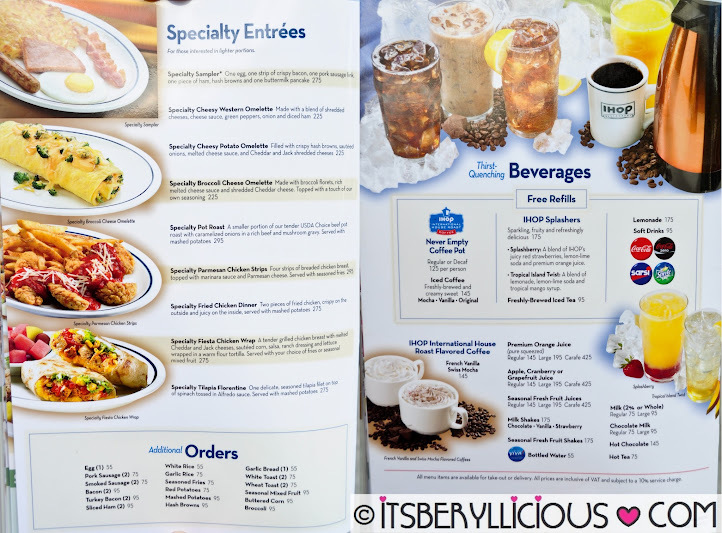 I can't wait to visit IHOP again. 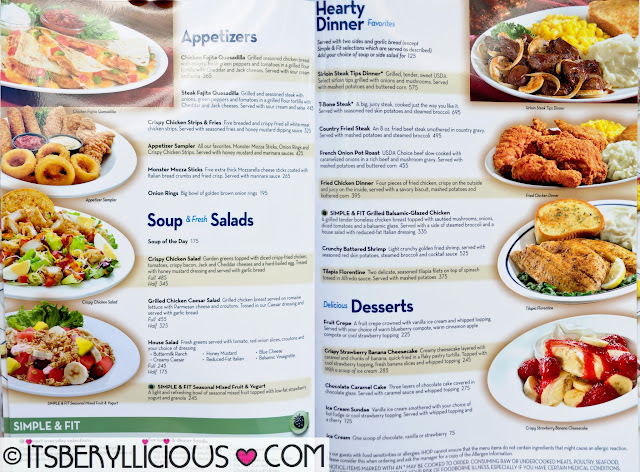 There are a lot more dishes that I want to try from their menu. Even though the place was packed with customers, service was fast and the waiters were very attentive to our needs. Price wise, I think it's quite reasonable given its serving size. 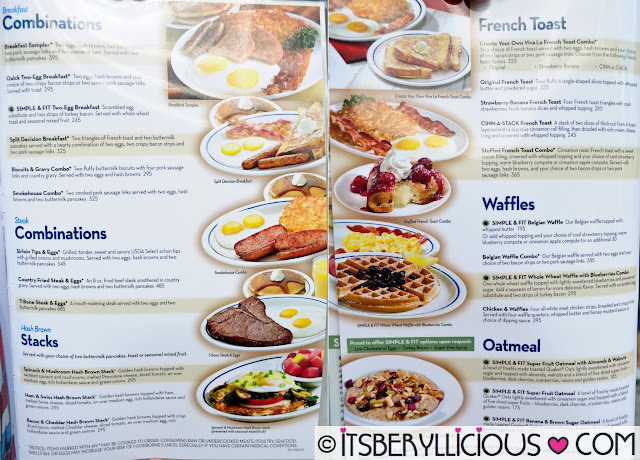 An order could already fill up one's appetite especially with all the carbs from the pancakes and hash browns. 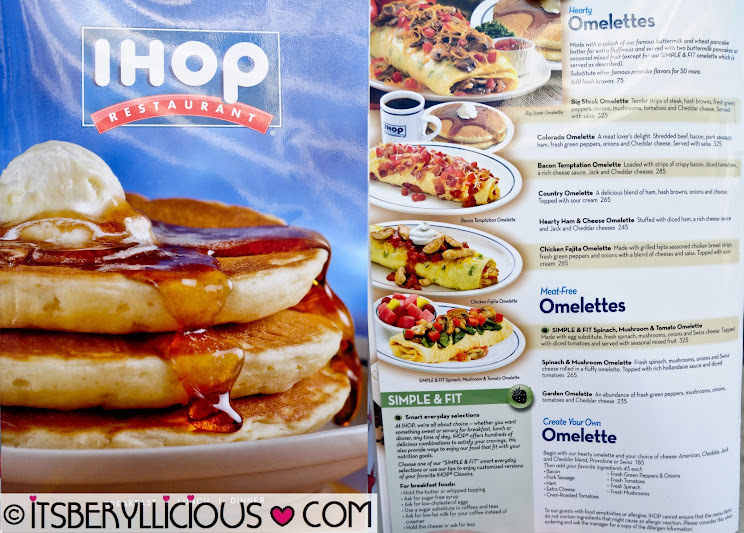 Healthy eaters could also choose from IHOP's Simple & Fit selections to enjoy their favorite IHOP classics less the guilt. W Global Center, 30th Street, cor. 9th Ave.
What a great way to reload all the energy you burned haha. You two are energetic as always! Miss exercising with you two tuloy. We tried eating here last Sunday but the queue was so long so we transferred to another Restaurant. Just means, how popular the place is. Honestly, I rarely visit The Fort because I think it's only for the rich and famous! Hahaha! Was running a few circles in the Fort just this evening and the lines were still packed! I wonder how many rounds do I need to burn off some of these calorific concoctions? glad IHOP has finally reached the Philippines. we love their original buttermilk pancakes and lots and lots of honey!! Agree! Good thing we waited for less than an hour only.. Heard others took more than an hour. 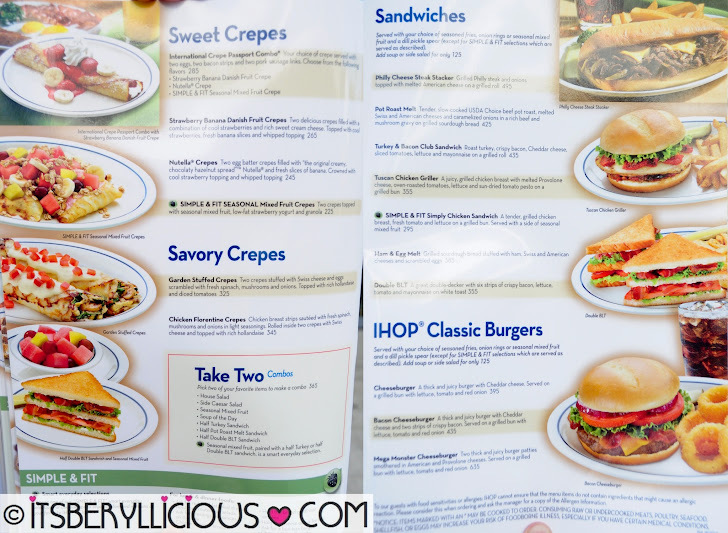 I know I've heard of IHop before and for a moment I was considering to check it out. However, I saw Jfides comment below and to me that is quite disturbing. What bothers me in the food blogging events now is that when you are in an event (sponsored), it seems that food quality and service is good because they know that the photos and service will be published but that's not always the same for the paying customer and to me that defeats the purpose of the establishment. Do they want to look good only in pictures or actually deliver the actual product they advertised they will. I'm not sure if this is a sponsored post or not but if it is then maybe we can tell the PR of this company to do something about what the actual paying customers say about their restaurant. If not, then thanks for sharing a good review of the restaurant and I hope that you will stay to be unbiased.